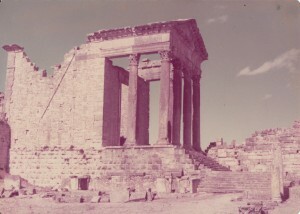 Dougga is perched on a hill and right at the top is the spectacular skeleton of the temple of Mercury, with its four columns looking out over the countryside. The whole [Roman] city is fairly well-preserved and one has a vivid impression of being in a place that was once very busy. There’s a theatre and it must once have been the most magnificent in the whole Roman world. As nightfall was approaching, and I was beginning to wonder where I would spend the night, I bumped into a group of tourists who were also looking over the ruins. Within five minutes learnt that they’d been at the Bourguiba Instt as well, doing the same course (I thought one of them, Bernard, looked familiar). They had hired a car in Tunis and were traveling around the country. They immediately offered me a lift to Teboursouk, which is the town closest to Dougga, placed conveniently on the main road. When they heard I was going to Kairouan, Laurent (there were four of them, Laurent, Bernard (both French), Marith, a Dutch girl, and Faris, a Tunisian) immediately suggested that I go with them. But Bernard hedged a bit at that and said the car was too small (which it was) to take 5 people a long way. Anyway, we reached Teboursouk and went to the local tourist hotel. Naturally it was too expensive for me but as soon as I suggested that I’d go off to sleep in the wilderness they said they’d pay. Absolutely insisted and I couldn’t really have said no without being offensive. But as it happened we didn’t stay there after all and went on a bit. 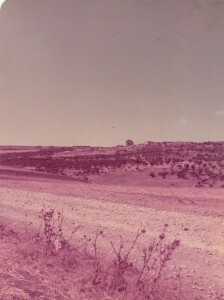 The car broke down and we had some trouble, but eventually stayed in a town called El Kef, in a place I could afford.